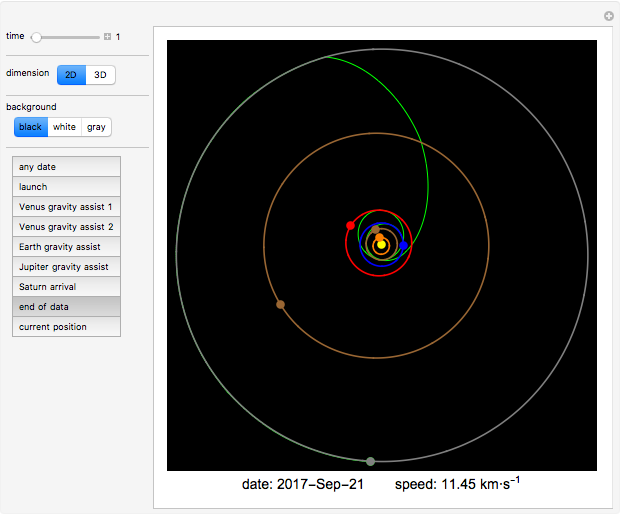 This Demonstration shows an animation of the flight of the Cassini spacecraft's mission to Saturn. This spacecraft used a technique called gravitational assist four times—twice with Venus on April 26, 1998 and June 24, 1999, once with the Earth on August 18, 1999 and once with Jupiter on December 30, 2000. 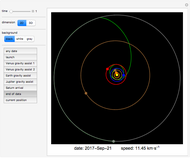 Saturn orbit insertion occured on July 01, 2004. The orbits of the planets have the following colors: Mercury: orange, Venus: brown, Earth: blue, Mars: red, Jupiter: brown, Saturn: gray. The time step is one day, positions are at midnight, and the speed is measured relative to the Sun. The origin is at the Sun with the positive axis pointing toward the vernal equinox. Nothing here is modeled; all positions of the spacecraft and planets were obtained from NASA JPL. We thank NASA JPL for providing the data. Information about the mission can be found on NASA's Cassini website. 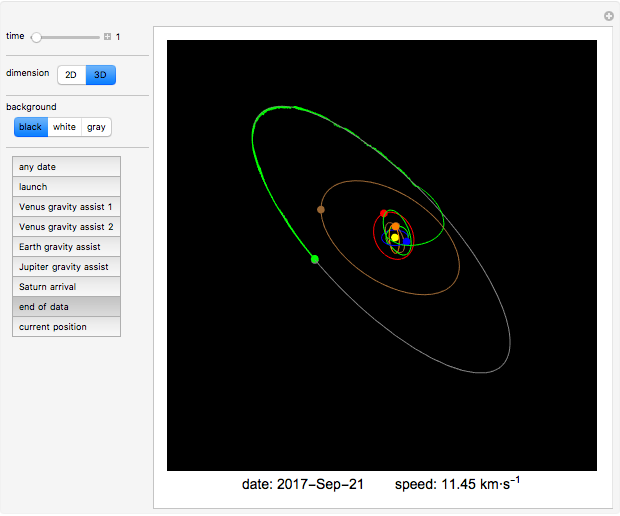 More information about the gravitational assist can be found in . A manual on how to create such an animation can be found in . For more information, see the author's website. T. Franc, "The Gravitational Assist," in Week of Doctoral Students 2011—Proceedings of Contributed Papers: Part III—Physics (WDS 2011), Prague (J. Safrankova and J. Pavlu, eds. ), Prague: MatfyzPress Publishing House, 2011 pp. 55–60. www.mff.cuni.cz/veda/konference/wds/proc/pdf11/WDS11_309_f12 _Franc.pdf. T. Franc, "Gravitational Assisted Trajectories—Making Your Own Pictures and Trajectory Study," in Proceedings GIREP-EPEC Conference 2011, Physics Alive, Jyväskylä, Finland (A. Lindell, A. Kähkönen, and J. Viiri, eds. ), Jyväskylä, Finland: University of Jyväskylä, 2011 pp. 202–207. www.jyu.fi/en/congress/girep2011/main-page/electronic-proceedings-of-the-girep-epec-2011-conference.pdf.